The weather has suddenly turned cooler. I was craving for something filling and warm. 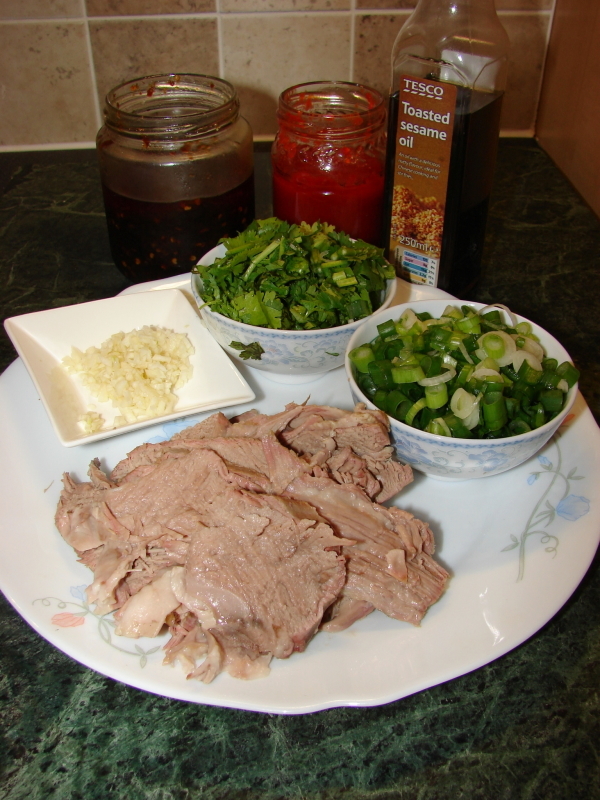 I bought a piece of lamb shoulder last week, time to make some yang rou pao mo. I can eat some and store the rest in the freezer for later. 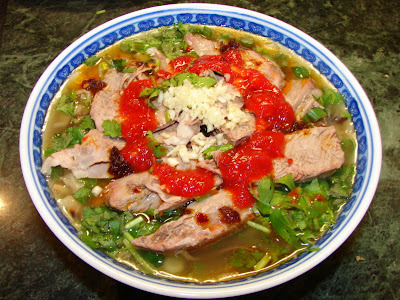 Yang Rou Pao Mo 羊肉泡饃 is a famous xiao chi 小吃 (small eat or snack) from Xian, warm and comforting. Yang Rou 羊肉 is lamb, Pao 泡 is soak and Mo 饃 is a flat bread or shao bing 燒餅. The proper name for this 'mo' 饃 bread is called 'tuo tuo mo' 坨坨饃. I think the word 'mo' 饃 is a common name/word used by Muslim-Chinese or western part of China for most kinds of flat breads. 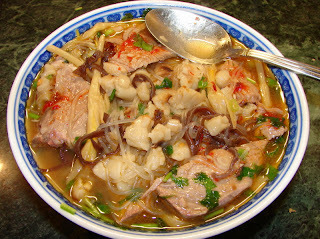 Yang Rou Pao Mo consists of several parts, the soup (stock), the meat after making the stock, the bread, the noodles and dried vegetables and the final part is all the garnishes and sauces. The preparation is not complicated, just take some time to simmer the soup. I have seen some recipes which require 8 - 12 hrs simmering time for the lamb (mainly cooking in bulk like in restaurants), I find 2 - 2.5hrs is about right for home cooking. The bread is easy normally just flour and water, I find it a bit too dense without a leavening agent I prefer to add a little baking powder to make the breads lighter, easier to torn and easier/ quicker to absorb the soup. This bread can be made well in advance.The other ingredients involve soaking, cutting and/or chopping, all can be prepared in advance. The final assembly and cooking only takes minutes. This recipe is enough for 4 people. Make the stock. Put the water into a stock pot, add the lamb (and bones if using). Heat at medium and start boiling from cold. When the water is boiling, turn heat down to medium low and continue simmering without stirring. You will see scum beginning to form on the surface. Let this boil for about 10 - 15 minutes, at the same time skim off the scum when you see enough of it to remove. When no more scum is forming add all the spices and spring onion, turn the heat down to lowest, cover with lid and simmer for 2 - 2.5 hours till the meat is tender but not falling apart. When done remove the meat, cover lightly to let steam escape and leave it to cool. Cut meat into thin slices. The meat is easier to slice when it is completely cooled. The spices in the stock can be removed by a small sieve. There will be some fat floating on the liquid. If you mind you can skim it off. I never do because there isn't much as I normally use reasonably lean lamb shoulder. 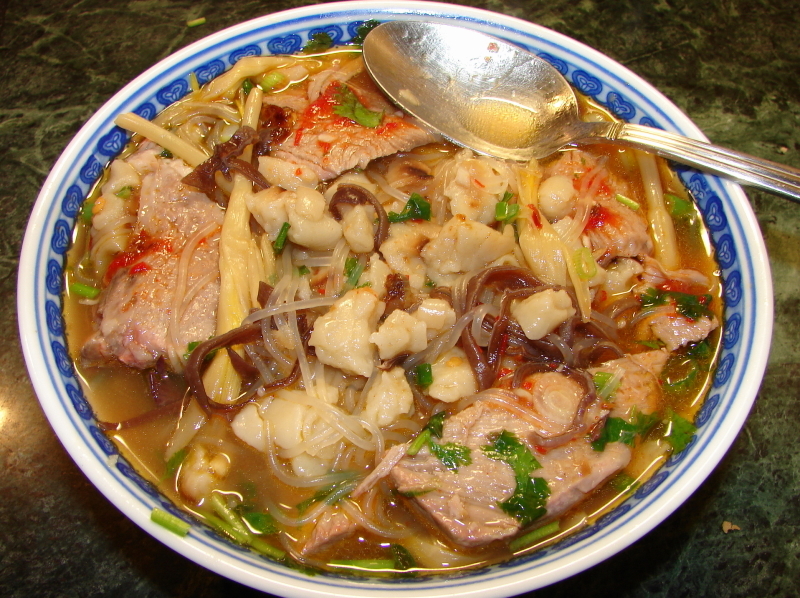 Traditional recipe adds extra lamb dripping to the stock before serving. To make the flat bread, mix a little baking powder with the flour then add water and mix. The dough should be quite stiff. Leave it to rest without kneading for about 20 - 30min. After resting the dough is much easier to knead and becoming smoother. Roll the dough into a log shape and cut into 10 equal pieces. Roll each piece of dough into a ball and flatten it to round disc about 8mm thick. The bread is ok to go straight onto the griddle, but if you like to shape the flat bread a little bit more fancy and traditional, lightly tap with a knife against the edge of the bread forward and backward while gentle holding the bread with one hand. This is to heighten the thickness of the bread around the edge, so the bread inside thickness is about 8mm and outside is about 1cm. See slight show below. Put the 'mo' bread on a griddle pan without any oil and cook till browned both sides. Remove and wrap with a clean tea towel and leave to cool. 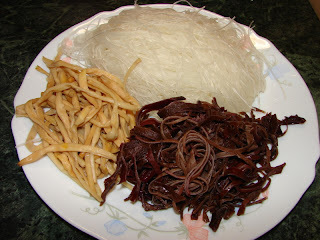 Soak the glass noodles, woodears and dried lily buds. Rinse/clean all after soaking. Drain noodles and set aside. Check the lily buds for woody stem at one end, remove. Thinly slice the woodear. Chop the spring onion, coriander and fresh garlic. If using pickled garlic no preparation is needed. Just before serving, heat the soup to boiling. Season soup with light soy, salt and/or chicken bouillon stock powder. Add dash of cooking wine and black vinegar to taste. Torn the bread into tiny pieces, allow 2 - 2.5 pieces of bread per person. Now the final step is to cook the bread in soup with the glass noodles, woodears and lily buds. You can do this by individual portion or the same pot for all. When the soup is boiling, add woodears, lily buds and torn bread together. Simmer till bread is soften and swollen then add the glass noodles and cook for another minute till piping hot. Ladle into serving bowl/s. Get ready the sliced meat, garnishes, oils and sauces. Arrange sliced lamb meat on top. Sprinkle on some chopped spring onion, coriander and fresh garlic if using. Drizzle on some some chilli oil, sesame oil and add a dollop of chilli sauce. If using pickled garlic serve this with the soup on the side dish. Add all the garnishes, meat and sauces and oil. Thanks for this recipe. I like soups these days. 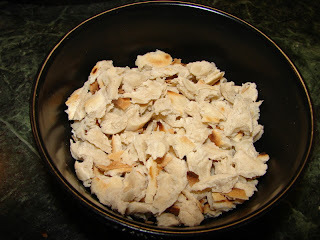 And I will also try to make the flat bread myself. Hari Raya is one day later in Brunei (falling on 31st). Malaysians celebrated on 30th. I might even visit the Sultan this year if there is no congestion. He will have open house for three days. Sigh. What a comforting soup this one is. I guess the "pao" is like flour dumpling in the soup. BTW,yes you are right. I can't see the two pix/slideshow. Hopefully you can fix them. The slideshows are now ok to view. The root of the problem is Picasa has added new step to open or restrict albums to show, this wasn't there before. I first had this in Xian back in the early 80's, at a rambling Moslem restaurant that occupied the upper floor of half a dozen buildings. The bread was given us at the beginning as we sat down. It was really tough and it took forever to pull it into tiny bits. We amused ourselves with starters like immense cloves of pickled garlic (quite mild) during this chore, and then the waiter took our bowls of bread fragments away to mix into the lamb soup. Very good. I always wanted to go back there, but it succumbed to redevelopment of much of the Muslim quarter. A couple of years ago, after badgering my Chinese colleagues for years, we went to a modern place that served the same dish. Same tough bread but they had a shredding machine for lazy folk. A moral outrage. I miss that old place. So much in China has been lost, destroyed, paved over, that should have been treasured. I was there often in the 80's and early 90's when this was happening so fast. I never buy anything in China anymore except hard to find ingredients, no handcrafts anymore hardly. Such a shame. Good food, though, and so much better than in the early 80's when in February there were no fresh vegetables to be had except garlic shoots, and no meat at all (I was staying on the Chinese government dime in their institute guesthouses and the like). Wow, this looks amazing! I have only made DaPanji from this area but this is definitely next on my list when I get a spare evening. Thanks for your great recipes as ever. I made the soup - thanks for the inspiration!